On November 10, in front of Yumuchion on Taketomi Island, islanders with model horse heads around their waists performed Umanusha, which expresses the motion of riding a horse. On November 10, Tanadui Festival and votive performances with more than 600 years of history, and which are designated as significant intangible folk cultural assets, began at Yumuchion on Taketomi Island. 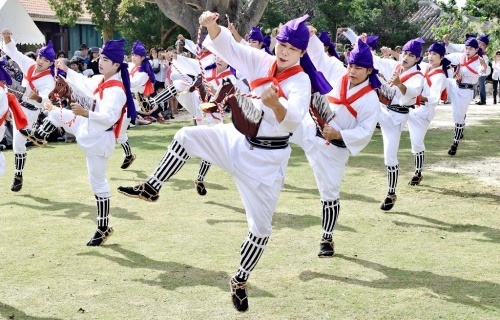 Islanders offered dances and performances, such as kyogen plays, and prayed for the island’s prosperity. Eighty stage and garden performances were given on November 10 and 11. After 9:30 in the morning of November 10, performances such as impressive martial arts with sticks, drumming, and farming dances called Mamido and Jichu were presented in front of Yumuchion. Jichu expresses the joy of peasants who were given the opportunity to have an audience with the king of the Ryukyu Kingdom after paying their annual poll tax. Photograph: On November 10, in front of Yumuchion on Taketomi Island, islanders with model horse heads around their waists performed Umanusha, which expresses the motion of riding a horse.